THIS CENTER IS NO LONGER AVAILABLE. This Del Mar Deposition Center is near the 101 and 805 freeways. 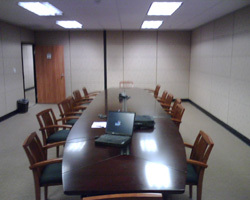 We have two deposition suites which can accommodate up to 40 people. Our friendly and knowledgeable staff provide support services on an as-needed basis.